Postcard US-2984204 from Texas shows the American Museum of Natural History (AMNH), located across the street from Central Park on the Upper West Side of Manhattan, New York City, New York. One of the largest museums in the world, the museum has over 32 million specimens of plants, humans, animals, fossils, minerals, rocks, meteorites, and human cultural artifacts in its collection. Only a small fraction of those can be displayed at any given time, in spite of its 1,600,000-square-foot or 150,000-square-meter exhibition space. In addition to its permanent exhibitions at the Biodiversity and Environmental Halls, the Birds and Reptiles and Amphibians Halls, the Earth and Planetary Sciences Halls, the Fossil Halls including the two famous dinosaur halls as shown on the postcard, the Human Origins and Cultural Halls, and the Mammal Halls, the current exhibitions include: Countdown to Zero about several global efforts to contain, or eradicate disease; Nature's Fury: The Science of Natural Disasters; The Butterfly Conservatory; and Natural Histories. The museum is also home to the Rose Center for Earth and Space that features a planetarium, and the official New York State Memorial to New York's 33rd Governor and the 26th U.S. President Theodore Roosevelt. 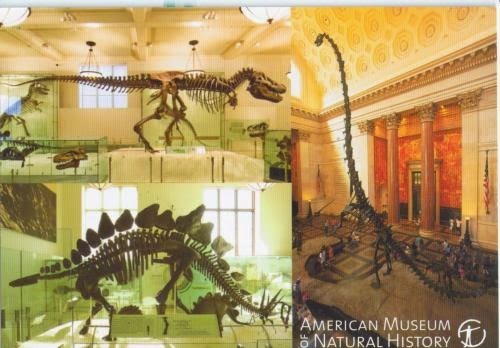 AMNH was added to the National Register of Historic Places on June 24, 1976. The Museum will be closed on Tuesday January 27, 2015 due to a blizzard forecast. However, the early indication shows the incoming storm may be falling short of predictions.